i wasn’t done. | kensfolk. I made another one. This one is quite a bit larger, and more colorful. Forgive me, it’s just a cell phone picture. 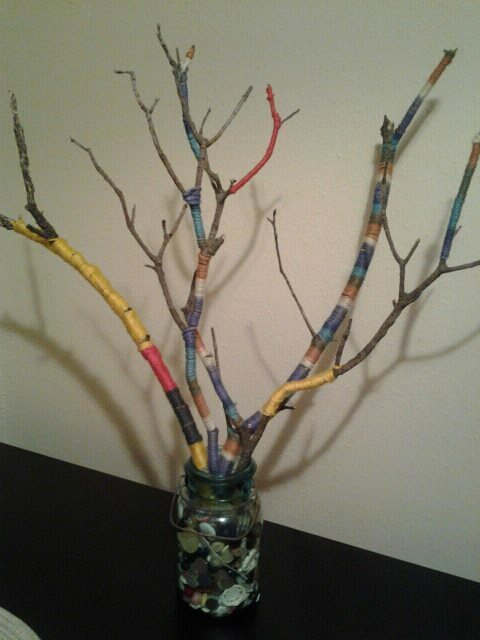 To keep the branches from moving, I put them in an old antique jar of old buttons. This arrangement is going to the bedroom, so I can feel like I’m waking up inside of the Free People store every morning. On to another day of creating, then class (where I get to learn how to throw clay on the wheel for the first time- I’ve only been doing sculptural ceramics thus far), then catching up on Dexter with friends over donuts and chinese food. I’ve been really diggin fall. All cozy and stuff.